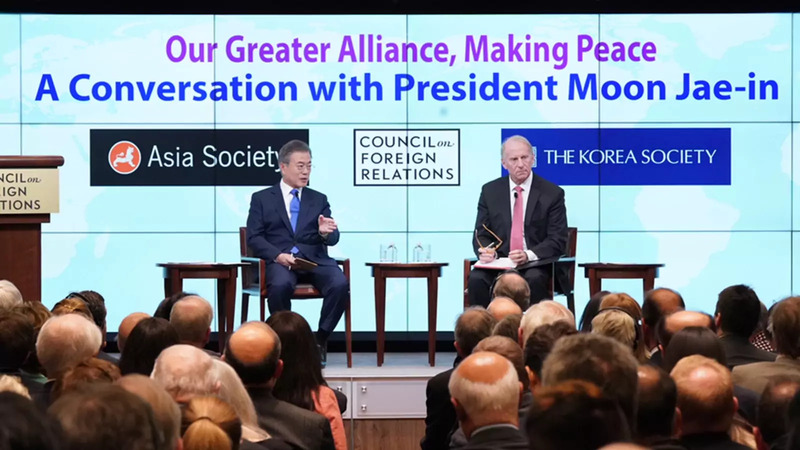 President Moon Jae-in discusses the current situation on the Korean Peninsula and South Korea’s alliance with the United States. Let me just give one minute of setting. We meet today, a day after—one day after President Moon met with President Trump here in New York, and the reports were that they endorsed the idea of a second summit with the leadership of North Korea, second U.S.-North Korean summit. And this comes just days after President Moon’s most recent trip to Pyongyang. And, somewhat further afield, we’re about three months, give or take, since the Singapore summit. So a lot has happened, but at the same time many questions remain regarding commitments made and next steps. So here is how we’re going to address these issues this afternoon. First I’m going to ask Kevin Rudd, who’s president of the Asia Society’s Policy Institute, and as you all know former prime minister of Australia—increasingly, one of many—(laughter)—cheap shot—(laughter)—Kevin’s going to make some brief remarks. And then he’s going to be followed by Tom Hubbard, who chairs the Korea Society, and Tom served with great distinction as the U.S. ambassador in Seoul. President Moon will then give formal remarks for fifteen minutes with simultaneous translation. So unless you’re fluent, I recommend that you use headphones at that point. After which the president and I are going to have a relatively brief conversation, then we’ll open up to questions with our members. And for that part you don’t need the headphones because we’ll do that with consecutive translation. So, with that, again, I want to welcome the president and turn the microphone over to Kevin Rudd. Mr. President, you are a welcome guest here in New York and in America. And it’s not just because you’re president of a truly beautiful country which I’ve had the privilege to visit so many times over the years, but this remarkable Korean democracy which has produced a vibrant political life in your country and an extraordinarily creative economy. And this has been nothing short of the great Korean miracle. And for those of us who have seen it up close, personal with our eyes, it gives us a natural sense of affection for what you’ve achieved in the extraordinary period since 1953. So, for those reasons alone, Mr. President, as the president of the Republic of Korea, you’re a welcome guest. But, Mr. President, what I’d commend you for is for seizing the opportunity and for going out there and changing reality. And, of course, there’s a long way to go, but you have changed the dynamic. Two or three very quick points. The first is just simply to congratulate you on finally bringing about peace in our time in trade relations with the United States. Well done. (Laughter.) Many other governments around the world are envious of you at present. (Laughter.) I won’t name them. But this is good, and it’s good for the cause of free trade in the region and around the world. The second point is simply to congratulate you on the most recent visit. As someone who knows a little bit of the history of your country—I’m an Asianist by training; we’ve studied the history of the three Korean kingdoms when I was at university—the sight of you and Kim Jong-un on Mount Paektu for me was a deeply moving sight. This was extraordinary, knowing something of the history and significance of this particular place in the long civilizational history of Korea. And finally, Mr. President, in my allocated two minutes from the CFR president for life, Richard Haass—(laughter)—is simply an observation as we embark upon a difficult journey ahead. What we see, of course, is this great period of rapprochement between North and South, engineered by the chemistry and the policy of your own visit. And secondly, we still look with sobriety at the absence so far of substantive moves by the North on the denuclearization front—the absence, for example, of an inventory of nuclear weapons and what they hold—and therefore point to the future with some concern about will this see a divergence over time as the two Koreas become closer, a divergence between the Republic of Korea and the United States and America’s allies in the region. But that is a long way into the future, and I’m sure these concerns you are acutely alert to in the negotiation of your diplomacy with the North. HUBBARD: Mr. President, Madam Kim, as chairman of the premier American institute—institution devoted exclusively to the promotion of relations between the United States and Korea, I am truly pleased to join the Council on Foreign Relations and the Asia Society in welcome you—welcoming both of you here to New York. Mr. President, your time in office has been short—still less than a year and a half, I believe—but your accomplishments have, indeed, been impressive. Many of us have probably already forgotten that you took office at a time of deep domestic challenge in Korea. We all watched with admiration as you led you nation past the trauma of impeachment to restore confidence in the democratic process in one of the most vibrant democracies in the world. Your diplomatic accomplishments are even more impressive. Your diplomacy vis-à-vis North Korea has created new opportunities to reduce tensions and build peace on a Korean Peninsula that will someday be free of the nuclear threat. This time last year we were watching the North Koreans carry out increasingly threatening nuclear and missile tests, and we were worried about imminent war on the peninsula. That we are now talking about how best to pursue our common interests through high-level dialogue, that you have met three times with the North Korean leader, and our President Trump is already talking about a second summit with the North Korean leader, this is all a direct result of your courageous willingness to engage your North Korean counterpart in serious discussions. And you’ve also demonstrated your commitment to U.S.-Korea relations, to our alliance, in another—in many other ways, including your willingness to negotiate improvements to the Korea-U.S. Free Trade Agreement aimed at giving U.S. products greater access in the Korean market. The meeting you had yesterday with President Trump and your signing ceremony was very encouraging to all of us. And, finally, like Mr. Rudd, as a friend of Korea, I was deeply moved at the sight of leaders of South and North Korea standing together with their wives at the top of Mount Paektu last week. We all realize that we have a long way to go before we will have true peace on a unified Korean Peninsula, but that dramatic photo was a hopeful sign of what may someday be possible. As friends and allies, the U.S. and the Republic of Korea must stand together to pursue reconciliation based on elimination of the nuclear threat and the betterment of the lives of all of the people in Korea, particularly in North Korea. And the Korea Society stands ready to assist in this process in any way possible. MOON: Honorable President Richard Haass, Chairman Thomas Hubbard, President Kevin Rudd, distinguished guests, I’m delighted to meet you all. I’m grateful to these three leading organizations of international relations for hosting and inviting me to this event. These three institutions serve as a link between the United States, Asia, and Korea. In particular, I’m most thankful to them for their profound interest in and affection for the issues related to the Korean Peninsula. It’s very meaningful for me to be able to share the outlook on the rapidly-changing developments surrounding the Korean Peninsula with the most prominent experts on Asia and Korea and to converse with them about peace and prosperity on the Korean Peninsula. Around this time last year, when I attended the United Nations General Assembly for the first time, tensions over the Korean Peninsula reached their peak. North Korea went ahead and carried out six nuclear tests and the U.N. Security Council adopted its toughest-ever sanctions resolution. Dark clouds of war cast a shadow over the Korean Peninsula and there was a war of words at the U.N. General Assembly. Under such circumstances, I appealed to North Korea and the international community to resolve problems through dialogue. I asked the North to give up its nuclear program and back on the path toward peace. I asked for the international community’s support and engagement to ensure that the 2018 PyeongChang Olympic Winter Games would become the Olympics of peace. However, many people did not believe that it would become reality. To many, it may have sounded like an unrealistic dream. One year on, something miraculous is taking place on the Korean Peninsula. The prelude to peace was the PyeongChang Winter Olympics held in February this year. North Korea sent its delegation and athletes to PyeongChang. On April 27, I had my first summit with Chairman Kim Jong-un in Panmunjom. We adopted the Panmunjom Declaration, that aims to achieve complete denuclearization and establish a permanent peace regime on the Korean Peninsula. In June, the historic U.S.-North Korea summit took place for the first time in the history of the seventy-year-long hostile relations. This great decision was born from a combination of mutual trust and respect from the leaders of the United States and North Korea. North Korea demonstrated its sincerity by dismantling their nuclear test site, returning the remains of the fallen U.S. soldiers, and choosing not to display intermediate- or long-range missiles during their military parade that marked their Foundation Day on September 9. And last week I was in Pyongyang. I had my third inter-Korean summit with Chairman Kim Jong-un and signed the Pyongyang Joint Declaration together with Chairman Kim. Chairman Kim personally pledged in public that he would make the Korean Peninsula a land of peace free from nuclear weapons and threats. He also expressed a hope of completing denuclearization as soon as possible to focus on economic development. North Korea has refrained from nuclear and missile provocations since last November. Under the watchful eyes of the international community, it also dismantled their nuclear test site in Punggye-ri. Last week, in order to speed up the denuclearization process, North Korea made a clear commitment to, first, permanently dismantle their missile engine test site and launch platform in Dongchang-ri under the observation of experts from the relevant countries. Moreover, in accordance with the spirit of the U.S.-North Korea summit, North Korea expressed its willingness to take additional denuclearization measures, including permanent dismantlement of the nuclear facilities in Yongbyon, as the U.S. takes corresponding measures. This means that North Korea will pursue a verifiable and irreversible denuclearization. To expedite the denuclearization process, Chairman Kim is hoping for a visit to North Korea by the U.S. secretary of state, Mike Pompeo, and a second U.S.-North Korea summit to be held at the earliest possible date. Distinguished guests, actions are being taken to ease tensions and promote exchange and cooperation between the two Koreas as well. Two weeks ago, the Inter-Korean Joint Liaison Office was opened in Kaesong, North Korea. We now have an official channel that allows year-round twenty-four-hour communication between the two Koreas. In August, reunions of separated families were held. Unified teams made up of South and North Korean athletes competed in a number of events in the Jakarta Palembang 2018 Asian Games, as they had done at the PyeongChang Winter Olympic Games, and won the gold medal in one of the competitions for the first time in the Asian Games. The most important accomplishment is the agreement—(inaudible)—included and instituted PyeongChang Joint Declaration. The two Koreas agreed to a mutual cessation of hostilities on the entire Korean Peninsula. This is akin to a declaration to end the Korean War and it substantially eliminates the danger of war. Efforts will be made to demilitarize the heavily-fortified Demilitarized Zone and Joint Security Area and transform them into a symbol of peace. These are important strides towards realization of a Korean Peninsula free from war. The declaration to end the Korean War that the two Koreas are pursuing is a step that must be taken if we are to move toward a peace regime. It is also necessary for expediting North Korea’s denuclearization measures. There are concerns in some quarters that the end of our declaration may affect the status of the U.N. Command or the United States Forces in Korea. These are not simply true. The declaration is a political statement made on the journey towards a peace treaty, and therefore the existing armistice will remain in place until such a peace treaty is signed. As for the stationing of the USFK, this is a simple matter for the ROK-U.S. alliance to decide regardless of a declaration to end the Korean War or the signing of the peace treaty. Chairman Kim also agrees with this concept of an end-of-war declaration. These developments have allowed the two Koreas, as well as the neighboring countries, to be freed from the fear of war that gripped them just a year ago. None of this would have been possible without the bold decision made by President Trump and the consistent support of the international community, including China, Japan, and Russia. Yesterday, President Trump and I had candid discussions on all of these matters. We shared the view that a swift implementation of the Sentosa Agreement, Panmunjom Declarations, and Pyongyang Joint Declaration is of paramount importance. President Trump and Chairman Kim Jong-un trust each other. The denuclearization talks between the United States and North Korea that have been stalled will resume in earnest. South Korea and the United States have responded positively to the actions taken by North Korea. Our two countries stopped large-scale joint military exercise involving the deployment of strategic assets. I expect that there will be significant progress in denuclearization if the leaders of North Korea and the United States sit down together again. Distinguished guests, cornerstone for peace on the Korean Peninsula is the ROK-U.S. alliance. Forged in blood, the ROK-U.S. alliance has become stronger and broader over the past seventy years. Had it not been for the alliance, it would have been difficult if not impossible for the Republic of Korea to simultaneously achieve both democratization and economic development in just half a century. Camp Humphreys in Pyeongtaek, where the recently relocated headquarters of the USFK resides, symbolizes the steadfastness of the ROK-U.S. alliance. It’s actually the largest one of the U.S. overseas military bases, boasting unmatched facility. And as a joint base for the Army, Navy, and the Air Force, as well as an operational hub, it has unrivaled operational capabilities. President Trump himself gave it a thumbs-up during our joint visit there last year. Initially forged as a military alliance, the ROK-U.S. alliance has continued to expand, moving beyond an economic alliance toward a global partnership. The ROK-U.S. FTA has enabled a dramatic expansion in exchanges and economic cooperation between the two countries. As an agreement between the world’s largest and the eleventh-largest economy, the FTA is a combination of the robust alliance and is serving as a catalyst for global free trade. Korea was able to foster greater partnership with the United States, which has the world’s largest pool of capital and technological prowess, while the U.S. obtained a bridgehead in East Asia. Yesterday, the two countries signed amendment to the Korea-U.S. Free Trade Agreement. With the amendment, I expect the people of our two countries will be able to enjoy gains from mutually beneficial trade. The U.S.-Korea will also work together on various issues facing the international community, such as terrorism, violent extremism, environment, health, famine, and refugee crisis. President Trump told me that Korea and the U.S. are not mere allies, but great allies. Freedom and democracy will last forever. Our alliance, forged in blood, (shared in our time ? ), will end the war without fail and lead us to peace and prosperity. Our alliance is already great. However, I believe that our alliance will become even greater through the establishment of peace on the Korean Peninsula. Distinguished guests, peace on the Korean Peninsula will not only contribute to regional security, but also bring shared prosperity to the peninsula and Northeast Asia. When peace is established on the Korean Peninsula through complete denuclearization, South and North Korea will pursue economic cooperation in earnest. An inter-Korean economic community will lead to economic cooperation in Northeast Asia. When an appropriate environment is created, Kaesong Industrial Complex and Mount Kumgang tourism project can be resumed. There are also plans to develop a west coast joint specialized economic zone and an east coast joint special tourism zone. This will give new growth opportunities for American and Korean companies. In my National Liberation Day speech on August 15, I proposed creations of an East Asia Railroad Community which encompasses six Northeast Asian countries and the U.S. At the Eastern Economic Forum in Russia last year, we also proposed a gigantic Northeast Asian Super Grid initiative to connect Russia’s energy Super Grid initiative with wind power and solar photovoltaic power from Gobi Desert in Mongolia. The East Asia Railroad Community will go beyond the energy and economic communities and become the foundation upon which the multilateral peace and security system will be developed. Peace will guide economy, and in return economic prosperity will further promote the—protect the peace. The participations of the U.S. in these endeavors will accelerate the development of the Northeast Asia region and become a great driving force behind the stabilization in the region. I would like to take this opportunity to urge the active participations of the U.S. Distinguished guests, esteemed experts in international relations, the people in South and North are no strangers to each other. We have lived together for five thousand years. We share the same bloodline, history, language, and culture. We are like siblings separated temporarily. We suffered through war and ideological conflict, but we have never forgotten that we are one. We aspire for peaceful Korean Peninsula free from the threat of war. The fervent desire of the eighty million Koreans and support from the international community are creating the miracle of peace on the Korean Peninsula today. HAASS: Well, Mr. President, again, welcome and thank you, and congratulations on all you have done to change the conversation and the dynamic in your part of the world. And as I said before, I will just ask a few questions, sir, and then we will turn to our members and guests. You spoke about the importance of moving from an armistice agreement to a formal treaty of peace. What conditions or steps would North Korea actually have to take, rather than commit to, in order for that to happen? MOON: Well, North Korea, as they have continuously promised to the international community, they need to embark on the road to complete denuclearization. However, for North Korea to actually embark on this path, the United States and the international community must end the hostile relations, and also they need to provide security guarantees to the North Korea regime. For this, I mean the transformation from the armistice into a peace treaty is needed. And a peace treaty will be possible at the last stage of complete denuclearization. At this stage first, as a first step, we will need to have the end of war declaration. Through this kind of declaration—because this is basically a political statement that announces the end of hostile relations—this will lead to more denuclearization measures from North Korea, and by then we will be able to begin the negotiations to sign a peace treaty. HAASS: Do you think that North Korea is prepared to significantly reduce the non-nuclear or conventional military threat their artillery and other systems pose to your country? MOON: First of all, in order to defuse military tension with North Korea, this needs to be done in a dual track. The first track would be denuclearization, and this is of course a process between the United States and North Korea. So the discussions between these two parties are needed. The second track would be threat reduction in regards to conventional weapons, and this track needs to be discussed between the two Koreas. Last week in Pyongyang we reached an agreement with North Korea regarding the preliminary steps to defuse military tension. If we could implement these measures in a proper way, then we will be able to remove the North Korean long-range artilleries that are targeting Seoul. And as for South Korea, we can also eliminate some weapons in kind. And also, this means that we will be able to remove more threatening weapons against each other, as well as thinking about the reduction of our forces. HAASS: If the North Koreans were to do many of the things they have said they would do, it would represent a fundamental change in their—in their policy. What do you think is motivating Kim Jong-un that did not—that did not motivate his father and his grandfather? Why do you think it’s possible that we could have this substantial a change on the peninsula now? MOON: Let me touch upon two things. First of all, I believe that President Trump has made a truly great decision and he has promised to protect—to provide security guarantees to the North Korean regime if it abandons its nuclear weapons. So I believe that North Korea is trying to embark on the complete denuclearization process in return for security guarantees. Afterwards, they would be able to focus on economic development. I believe that this is the national development strategy of North Korea right now. And also, in this vein, defusing military tension between the two Koreas is also this same context. HAASS: What can you say today to the Americans here that would reassure them about the U.S.-South Korean alliance in the following way. There is—there is some skepticism—I’m one of the skeptics—that North Korea will ever give up its nuclear weapons because they took the lesson to what happened to Ukraine. What can you say to reassure Americans that there will not be something of a North-South peace agreement that will put American interests, particularly denuclearization and long-range ballistic missiles, to the side? MOON: First of all, we have had many agreements on denuclearization with North Korea in the past, but unfortunately they had all collapsed. We have this distinct experience. So, therefore, I think it’s only natural that we have plenty of suspicion regarding the true motives of the North Korean regime. However, I believe that this is completely different this time round. In the past, the agreement was mainly reached through working-level negotiations such as Six-Party Talks. And in the implementation process, it proved to be very fragile and it collapsed eventually. However, this time for the first time in history the president of the United States and the supreme leader of North Korea met for a summit and they promised in front of the whole world. So I believe that because of this reason this promise will be kept. The most important aspect is that in Singapore during the summit and through the Sentosa Agreement, North Korea promised complete denuclearization, and in return the United States promised to end hostile relations, provide security guarantees, and work towards normalizing the relations with Pyongyang. And these measures will be done in exchanges. And if the two countries implement these measures in a sincere and genuine way, then I believe that we will be able to achieve complete denuclearization of North Korea this time round. And I can tell you that already North Korea is taking some genuine measures in this regard. Ever since last November, they have refrained from additional nuclear and missile provocations, and they have already permanently dismantled their nuclear test site. And in Pyongyang last week, through our Pyongyang Joint Declaration, North Korea also promised to permanently dismantle the missile engine test site, as well as the launch platform, under inspection from American experts. So if these measures are taken and implemented, I believe that this means that North Korea will no longer be able to engage in nuclear and missile provocations that threaten the United States and the international community. In the midst of it all, during my summit in Pyongyang with Chairman Kim last week, Chairman Kim told me that if the United States will provide security guarantees, and also if they give North Korea trust, that it will work towards normalizing relations with Pyongyang—these are actually the corresponding measures that North Korea is asking for—then North Korea would be willing to take additional denuclearization measures, including the permanent dismantlement of their nuclear base in Yongbyon. So I believe that setting a timetable for all these measures is a big task for the upcoming second U.S.-North Korea summit. So one thing that I would like to emphasize is that all these remarkable changes have been achieved based on our rock-solid ROK-U.S. alliance. And I believe that because of this reason, even after North Korea’s denuclearization, and even after the peace treaty is signed, and even after reunification, the ROK-U.S. alliance should remain in place in order to continue to uphold peace and stability in the Northeast Asian region. HAASS: I just have one last question, then we’ll open it up. To what extent do you believe Kim Jong-un is prepared to introduce economic and political reform into his country as a necessity, or to what extent do you think he’s afraid of introducing reform because it would threaten his rule? MOON: Well, up until November last year, Kim Jong-un had been engaging in nuclear and missile provocations, and by doing so he had been threatening global security. So I can understand why so many people have suspicions regarding Chairman Kim. This is why, in the course of having inter-Korean summits, I tried as much as possible to have direct dialogue with Chairman Kim. And also, we made a point of making efforts to broadcast live all these dialogue and the summits through live TV so that the footage of me meeting Chairman Kim could be seen by the whole world, so that the people can decide for themselves what kind of personality Chairman Kim is. So the Chairman Kim that I experienced, as you may have the same views as well, he is young, but he is also candid, and he respects elders. And he seems to have great aspirations to achieve economic development. So, even without nuclear weapons, if the United States could provide the trust that they will provide security guarantees and also aid North Korean economic development, then I believe that Chairman Kim is very much prepared to abandon his nuclear program in exchange for economic development. And this is what Chairman Kim had said to me. He said that he is aware that there are many people across the board who are saying that they still cannot believe North Korea in spite of all the measures for denuclearization that North Korea has already taken. And many people are saying that Chairman Kim is just trying to deceive people and he is maybe just trying to buy time. However, he was asking, in this kind of circumstance, by deceiving people and by just buying time, what exactly would he gain? And if he was indeed trying to deceive the United States, then he was very clear that he would be facing almighty consequences, a great retaliation from the United States, which North Korea would not be able to withstand. So this is why he’s asking for the international community to trust his sincerity. Well, this—regarding Chairman Kim’s sincerity, this is not just my subjective assessment, but those who have met him as well, including President Trump and Secretary of State Mike Pompeo. This is why the U.S. administration is still trying to have denuclearization dialogue with North Korea in the form of a second U.S.-North Korea summit. HAASS: Let’s get a first question from Thomas Byrne of the Korea Society. Q: Should I stand up? Right. HAASS: Yeah, why don’t you. Q: President Moon, in your vision for peace and prosperity on the Korean Peninsula, infrastructure projects are a prominent feature. But economic history teaches us that prosperity will ultimately hinge on institutional reform. Have North Korean and South Korean officials discussed what role South Korea could play to provide assistance to North Korea—assistance to North Korea for institutional reform, for example in the financial sector or investment laws and regulation? And related to that, has Kim Jong-un expressed any interest in joining the International Monetary Fund, a move that would be a prerequisite for mobilizing support from the international financial institutions such as the World Bank and even the Asia Infrastructure Investment Bank in Beijing? The transparency required would be a landmark reform, institutional reform, and I think would also serve as a strong positive signal to South Korean and other private-sector investors. Thank you. MOON: What I’m about to share with you is being shared on the premise that this would be done after complete denuclearization or North Korea or substantive progress in an irreversible way in terms of denuclearization. And by this we will have the sanctions relieved, so I’m talking to you on this premise. If this is the case, if this is the stage that we are envisioning, then South Korea would indeed be very much willing to play a leading role in providing assistance to North Korea for its economic development in the form of infrastructure developments. And this would just not stop at merely helping North Korea, but it will provide a new impetus for the South Korean economy and provide a new growth engine as well. However, these kind of endeavors would not be—just South Korea would not be able to bear these kind of endeavors on our own and there are certainly limitations. This is why I believe that there needs to be an establishment of an international fund that will assist North Korea’s infrastructure developments. And also, we will need to mobilize the World Bank, the World Economic Forum, and AIIB, these kind of agencies, to provide assistance to North Korea. And I believe that North Korea is very much willing to go through procedures such as accession to IMF or the World Bank in order to achieve this goal. HAASS: We have a question from Danny Russel of the Asia Society. Q: Mr. President, unity among the five major countries involved in dealing with the North Korean problem has always been very important, but it is clear that there are differences of approach emerging among the five countries. How do you think we can ensure that those differences don’t undermine the focus and the pressure on implementing U.N. Security Council resolutions and achieving denuclearization? MOON: The five countries surrounding North Korea, I believe, have a common objective in terms of denuclearization, and they all have expressed steadfast support towards the ROK’s policy or achieving complete denuclearization and permanent peace on the Korean Peninsula. And these five countries have also agreed to U.N. Security Council sanctions vis-à-vis North Korea, and they have also faithfully implemented those sanctions. Right now the Northeast Asian region is one of the most volatile places in the whole world, where conflict is simmering. And one of the reasons that we are in such a conflicted state tends to the military confrontation between the two Koreas. So, if we could relieve tension between the two Koreas, I believe that it will immensely contribute to peace and stability in the Northeast Asia region as a whole. And by doing so, I believe that Northeast Asia could become a peace community or an energy community, and we could even form a multilateral peace and security structure. Having said that, I do understand that there could be a difference in views among the five parties regarding the denuclearization process of North Korea. But if we could reach an irreversible stage, then I’m sure that the five parties will be cooperating. For this reason, I have already proposed the formation of an East Asia Railroad Community. By this I mean connecting the railroad between the two Koreas, which would be extended to China and the Russian Siberian railways, and it will eventually reach Europe. And I believe that this initiative will benefit all the countries in question. And this is actually taken a motive from what we saw in Europe in the past, the European Coal and Steel Community, which eventually led to the formation of EU. And by doing so, I believe that we will be able to establish an energy or economic community in Northeast Asia which could eventually lead to the multilateral peace and security architecture. And I’m doing my best to realize this vision.